To download and print, click on Gift Certificate above. 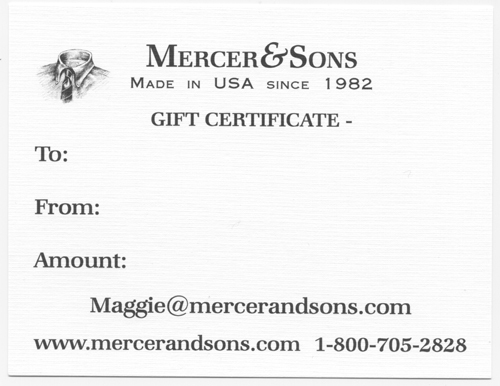 We're happy to send you (or the lucky recipient) a MERCER&SONS gift certificate for any amount or any number of shirts you may specify. We can do so by mail, by e-mail or by fax - whatever is fastest and easiest for you. Gift certificates are particularly easy to wrap and are the obvious solution when size or shirt preference may be in question. 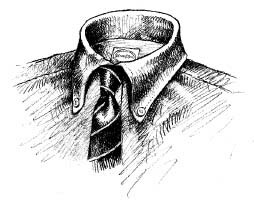 Special order shirts take time and our gift certificates offer immediate delivery of a placed order. Please call or e-mail us to set up your gift certificate today!